The Humboldt flowers freely giving your garden an extra visual aspect around Spring time and is considered a reliable cropper for a Nectarine tree. 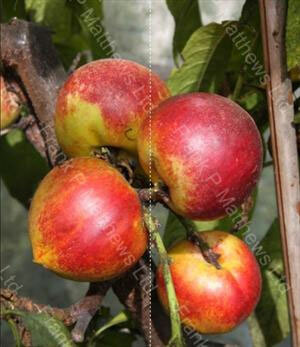 If you are an ancient Roman looking for a Nectarine tree then figure out what a phone or computer is and ask us for a Prunus Persica 'Humboldt'. Other normal people just ask for a Humboldt Nectarine, we will know what you mean. As with most Nectarine trees the Humboldt is self-fertile so there is no need to get another nectarine tree planted close by to use as a pollination partner. In simple terms, you could plant this tree in a maximum security psychiatric confinement room and it would still produce nectarines, provided the staff watered it and not inject it with sedatives. Under the right conditions the Humboldt is considered a good to heavy cropper. Those conditions being plenty of sun and not too much rain like that summer of 2012.